I must be one of the few people who hasn't seen the movie Thor that's doing the rounds in the cinema this month, but nevertheless I thought it seemed appropriate to choose Thor, Norse God of Thunder, as The Bad Witch's God of the Week. And Thor is also god of the day, because today is Thursday - or Thor's day! The photo isn't an image of Thor from the movie, or the Marvel comic book character the movie is based on - it shows a statue of Thor the Norse god, available from online retailer Pagan Magic. The description on the website says of Thor: "The fearsome deity is depicted as a warrior, scarred and muscled from years of swinging his magical hammer, Mjolnir, which was said to return to him after being thrown and to possess the power to hurl lightning. 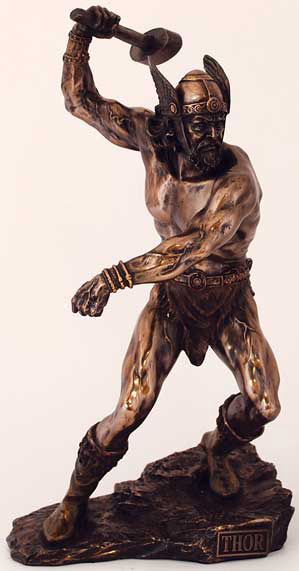 It was also his favoured weapon in the many tales in which he is said to have fought giants. Known as the frequent protector of the gods and humanity, he is also girded with his magical belt, Megingjord and the iron bracers, Jarngreipr, which magically increase his strength, allowing him to heft his mighty hammer in battle against the giants." Encyclopedia Mythica says: "The Norse believed that during a thunderstorm, Thor rode through the heavens on his chariot pulled by the goats Tanngrisni ("gap-tooth") and Tanngnost ("tooth grinder"). Lightning flashed whenever he threw his hammer." I always enjoy a good thunderstorm - and my garden could certainly do with a lot more rain - so I do hope Thor is pleased to be my God of the Week and decides to ride his chariot over London today. The Thor statue is 10 1/2" high and 5 1/2" wide and costs £55.99. It can be ordered at the Pagan Magic website.